My infatuation with Madhuri Dixit began when I was 8 years old. She was fresh off of her hit song “ek do teen” in the movie Tezaab and was touring the world doing stage shows with Anil Kapoor (who I still have a crush on too), and I went to go see her with my family at the PNE Colosseum. We had horrible seats and I borrowed my Uncle’s binoculars to watch her dance, and that was it; I was smitten. After that, most of my evenings and weekends were spent locked in my room trying to recreate her memorizing dance moves. Like millions of other Indians around the world, I’m crazy for Madhuri Dixit. When she left behind her stardom and moved to Colorado to be a “normal” wife and mom, she carved an extra little spot in my heart. I guess no matter how famous you are, nothing beats being a mom. Well, Madhuri is back and is now available right in the comfort of our own homes! 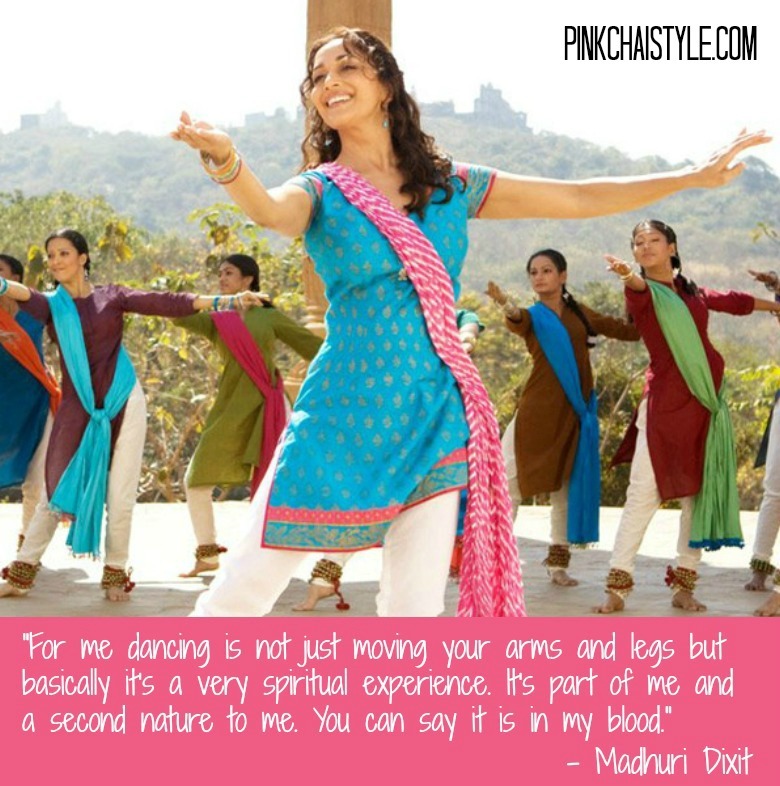 She recently launched Dance With Madhuri, an interactive site where she shares tips for learning her famous Bollywood dance moves. You can follow along with her videos, clear levels, get badges, and even submit your own videos for review by her team of choreographers! Okay, maybe you aren’t ready to share your “jhatkas” (dance moves) with the world yet, but it’s worth trying in the privacy of your own home. A fun way to get yourself and your little ones moving today. There were so many options for Madhuri performances I could have shared, but this song from Ram Lakhan has always been my favourite. It captures her beauty, simplicity, and amazing ability to dance with her body and eyes.